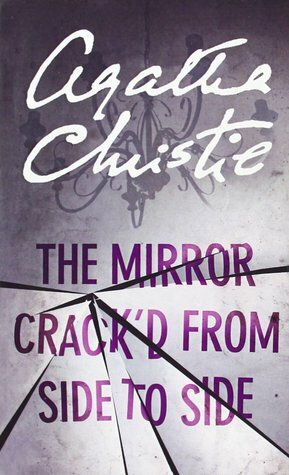 This month’s book for the Agatha Christie Reading Challenge is one of her later Miss Marple mysteries, The Mirror Crack’d From Side to Side, published in 1962. I tend to prefer the Poirots to the Marples, so I was curious to see what I would think of this one. The novel opens with the elderly Jane Marple recovering from a recent illness and deciding to take a walk around ‘the Development’, a new housing estate near her home in St Mary Mead. She falls and is helped to her feet by Heather Badcock, one of the new residents, who rushes out of her house to assist. Later, Mrs Badcock is poisoned during a party at nearby Gossington Hall hosted by its new owner, the famous American actress Marina Gregg. It seems unlikely, however, that Mrs Badcock had been the intended victim…it was only through an unfortunate set of circumstances that she came to drink the poison instead of Marina. Detective-Inspector Dermot Craddock begins to investigate, interviewing all those who were present at Gossington Hall at the time of Heather Badcock’s death and delving into Marina Gregg’s past, uncovering stories of adopted children, jealous rivals and a series of failed marriages. Miss Marple, however, is conducting some very different investigations of her own, based around what she knows of human nature. She is sure that the key to the mystery lies in discovering what caused the strange expression on Marina Gregg’s face just before Mrs Badcock dropped dead – an expression which other guests at the party described as reminding them of Tennyson’s poem The Lady of Shalott (“Out flew the web and floated wide – The mirror crack’d from side to side; ‘The curse is come upon me,’ cried The Lady of Shalott). This hasn’t become a favourite Christie novel and I didn’t find it quite as clever as some of her others, but I did still enjoy reading it. It seems that she got the idea for the plot from the tragic true story of a real American actress, although I won’t tell you her name because if you look it up it will completely spoil the surprises contained in the solution to the mystery. I correctly guessed who the murderer was very early in the story, but I had no idea what the motive could have been and had to wait for Miss Marple to explain it all for me at the end of the book! As well as being a murder mystery, this book is also an interesting study of some of the social changes taking place in 1960s Britain with a lot of time devoted to describing the houses on the ‘Development’ and the type of people who live there – with Miss Marple coming to the conclusion that, whatever the time and place, people are still people with the same hopes and ambitions, fears and uncertainties. It is through observations like this that she is able to move towards solving the mystery, drawing parallels between the suspects and other people she has known in the past. Miss Marple is also having personal problems of her own in this book, with her companion/housekeeper Mrs Knight, who treats her like a child and is generally overbearing and domineering. It’s clear that, however much Miss Marple’s age might be catching up with her physically, there is nothing wrong with her mind and she resents Mrs Knight’s condescending attitude. Again, I don’t want to spoil things, but there is a happy ending to this part of the story too! I can’t say that I loved this one, but I am looking forward to working through the rest of the Marple novels that I haven’t read yet. How strange you must have felt every time you watched an episode and there was granny! I love Agatha Christie’s books, but actually haven’t watched all that many of the TV adaptations. I think I probably saw this one years ago, but couldn’t remember either the culprit or the motive! I am like that with the Inspector Morse series…. I don’t know if I’ve read this one, but it has been made into a great movie and TV show a couple of times. I think I’ve seen one of the TV adaptations, but not the movie. It’s with Elizabeth Taylor, from quite some time ago. I prefer Poirot, but I do like the Miss Marple books too. Mrs Knight is such an irritating character! I admire Miss Marple’s patience in putting up with her for so long. This is a classic Christie, and I rather enjoyed that over the top movie they made of it starring Elizabeth Taylor. I don’t think I’ve seen it, but I would like to now that I’ve read the book. I enjoy the Poirots more, but I still have quite a lot of the Marple books left to read, so maybe I’ll change my mind as I work through the rest of them. I’ve read a few Christies but never a Marple. It’s hard to think of her books set in the sixties. TV versions have me thinking that all her work is set much earlier in the century. I think most of her best known books were written earlier in her career, so maybe the later ones haven’t been adapted for TV as often. I don’t really think of her as a 1960s author either. This is one I haven’t read but seen on tv a lot. So going into it I have a rough idea, I will see if it is in mums bookshelf and catch up on reading it too. I’m sure it will be worth reading even if you already have an idea of the plot. I’m never quite so keen on Christie’s later books – they don’t feel as sure-footed about society as her Golden Age ones. I love the motive in this one, though, and also love the Elizabeth Taylor version. I prefer her earlier books too. I haven’t been as impressed by the ones I’ve read that were published after about 1960. I remember this one very well because I thought the plot was quite clever. Never went back to reread it though, maybe because I remember it so well. Yes, that can be a problem with rereading mysteries! Once you know the solution, it can be difficult to forget it.